Stacking The Shelves is a weekly book haul meme hosted by Tynga of Tynga's Reviews. You might be wondering why there's a hardcover copy of Daughter of Smoke and Bone in my mailbox. In truth, I've had that copy for ages. No, really, ever since it came out a year ago. Why is it back "in" my mailbox? Because I went to Laini Taylor's signing at the Glendale Americana and yes, if you're wondering, it got signed. You'll also notice that there are two copies of Days of Blood and Starlight there. In truth, there is a third copy, but that one is on my Kindle. The story behind that? Well, the Kindle copy is thanks to Little, Brown Books for Young Readers and I bought the US copy of Days of Blood and Starlight in hardback at the signing; but the UK copy? That came by the Book Depository--because yes, I pre-ordered it--and I was extremely happy that it arrived in time for Laini's signing! The best part? It's a hardcover! Yes, they're all signed to me. And Laini's signing? It had a great turnout and she is freaking awesome. If you ever get a chance to meet her, definitely do so! ooh i always love it when authors personalize signs for their books to me! Book signings are awesome, I still need to attend one! Enjoy your books! Book Signings are always so much fun. The UK cover is way different than the US one. Nice. Wow! This might be the best haul I've seen today! I'm so freaking jealous! Although I'm from the UK I love the US covers much better! Happy Reading! I still have not read these books but want to so much!! WOW! Those are gorgeous and love that you were able to get them signed. :) I loved Daughter of Smoke and Bone, can't wait to read Days of Blood and Starlight! ENJOY! I haven't started this series yet but I want to soon, because I've heard a lot of good things about it! That's awesome!! I still need to get a copy of the latest book, I hope you enjoy your new books! Lucky that you got them signed! I have Daughter of Smoke and Bone on my kindle that I have yet to read :D Enjoy your (signed! :D) books! Ooh, you are very lucky!! (And I'm a little jealous.) 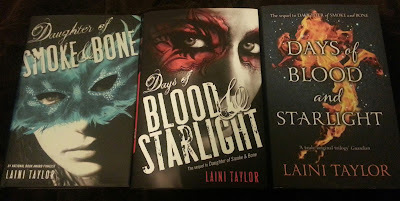 I really liked Daughter of Smoke and Bone, but haven't gotten to read Blood and Starlight yet. Like the UK cover of that one, too. I haven't read this series yet and maybe I should. Thanks for stopping by Tynga's Reviews. Oh wow some nice signed books!